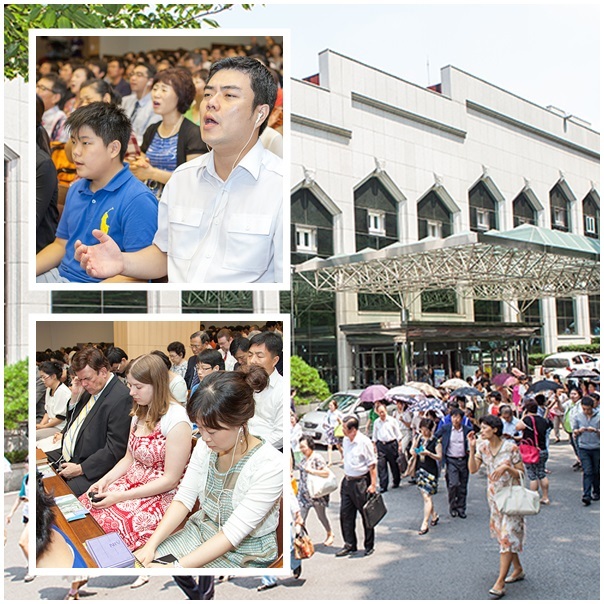 After the two sermons in 2013 Summer Conference and one in second service at the Pyungkang Cheil church, Dr. Bruce Waltke presented the last sermon in Korea on August 12th. As I traveled around the world thanks to the grace of the Lord, I feel that the people of the Lord are the same. It testifies that we also can have that grace of Jesus Christ through the work of the Holy Spirit. Being successful until the end is very challenging for leaders. Among numerous leaders, it is said that two-thirds of them fail. J. Robert Clinton, a theologian, has shown a statistics that, among 800 leaders in the Bible on whom people have actual information, only one-third of the leaders succeeded. King David once achieved the absolute power only to fail right after. However, losing that power did not mark the end of David's life. He ended up recovering from the failure, and that recovery was far greater than the failure. Indeed, it is a story about a leader who once succeeded and failed but prevailed in the end. The tile of the chapter 51 of Psalms: A Psalm of David. Historical background as to why this chapter was written is explicitly mentioned: “when the prophet Nathan came to him after David had committed adultery with Bathsheba." David's adultery with Bathsheba not only broke the seventh commandment but also the entire 10 commandments. David completely disregarded God's commandments. Based on the metaphors the prophet Nathan used, it can be seen that David committed theft and murder. Above all, he transgressed the first commandment. "Why did you take lightly of the word of God?” Prophet Nathan asked. This was the fundamental problem. Despite the transgressions, David later earned God's pity on him. 2 Samuel 12: 13 suggests no matter how big our sins are, God's grace is far greater than them. The Structure of the Chapter 51 of Psalms. The first and second verse is the part in which David seeks God. The verse from 3-6 is the part in which David repents. In the third and fourth verse, David repents of the sins that are revealed explicitly. In the fifth and sixth verse, he confesses that he couldn't avoid sinning for want of a spiritual ability. The verse from 7-9 is the part in which David beseeches God, seeking forgiveness on his sins and confessing his lack of spiritual ability again. The verse from 10 to 12 is the part in which David seeks a new willing spirit and prays for the ability to overcome all the sins. The verse from 13- 17 is the part in which David praises God personally. From the thirteenth and fifteenth verse, he praises Him through his mouth and from sixteenth and seventeenth verse, he gives burnt offerings to Him. In the verse 18, a national praise is given to God. David describes his sins as "my transgressions, my iniquity, my sins." The word sin includes a meaning of breaking a certain standard. 1. "My sins" mean to lose the entire God's standards. 2. The word "iniquity" means to leave behind the God's standards. 3. "Transgression" is the strongest word for sin, meaning to defy and clench one's fist. There are three words for God's grace as well. 1. " חָנַן" (Hanan) means to have pity. In Hebrew, it means to beg for the grace. 2. "חסד" (Hesad) means to pursue God's benevolence. It is mostly interpreted as sincere love. 3. " " (Raham) means to pursue God's mercy. This word represents mothers' posture. Like they pity their babies, God pities us. In the verse 9, David says "blot out all my iniquity." We commonly say to "blot out" means to remove the names of people from the book of life. Here, David seeks to be forgiven legally; however, he needs to seek forgiveness from the bottom of his heart because his conscience was tainted. This is the essence and fundamental issue addressed in this chapter: God's grace, pity and love will cleanse all the filthy transgressions, iniquity and sins. Next, David talks about his lack of ability to fight against sins. From the moment when he was inside his mother and to the moment when he was born, there were sins in him already. At the same time, however, he also notes that he had a conscience inside him. The problem was he cannot help but committing sins against his own volition though his conscience tells him what his good and evil. David then implores. From the verse 7-9, David begs to solve the problem that revealed his sins. Cleansing with hyssop (Psalms 51:7) refers to cleansing with water and blood. This expression is used when one looks at the dead body; looking at the dead by means to step into the realm of the dead and this means one can come to the realm of the live after sprinkled with water and blood. Because David committed adultery, he went into the realm of the dead. After receiving the hyssop i.e. blood, he begs to come back to the realm of the live. However, sins cannot be completely purged by hyssop and bulls (Hew 9:12-14, 10:4). At this point, David needs a genuine high priest as well as a prophet. The prophet is someone who will declare "you are forgiven," which can be inferred from David's claim— "let me hear joy and gladness." By saying that, he expects to rejoice after hearing from God who decides whether He would remove his sins. In addition to the words or the priests and the blood of atonement, another necessary step is to receive the ability to win over our sins by dint of the Holy Spirit. David kept on begging God to "renew a steadfast spirit within me"(Psalms 51:10) so that he could fight against all the sins. He also begs not to take the Holy Spirit from him as He did to Saul. Thus, it can be learned that God answers to our prayers when we pray God to hold us with the Holy Spirit. As David praises God, he states that he would teach others about God's grace. The verse 16 talks about offering a sacrifice for all the thanks given by God. In the Old Testament, when people received God's answer to their prayers, they first praised His name in word. Then they gave a great amount of offerings so that many people could share also. In this chapter, David disapproves such a practice. Next comes a national praise of God. If David maintains a proper relationship with God, the entire Israel can have it as well. The forgiveness that David eventually obtained was so significant that God gave him a son who later becomes the most affluent and influential king. I hope that we all experience such a cleansing when we pray from the bottom of our hearts for God's grace and salvation. The fourth sermon of Dr. Waltke was surely inspirational. He delivered the Word of God that filled each member of the Church with God's love. It was the time people could sense the spiritual connections made between him and the members of the Church by the Word of God. Moreover, as he delivered his message with all his heart, his profound love and respect for God were clearly manifested, not to mention the sacrifice he had made to defend God's word against all the attacks by liberalists. 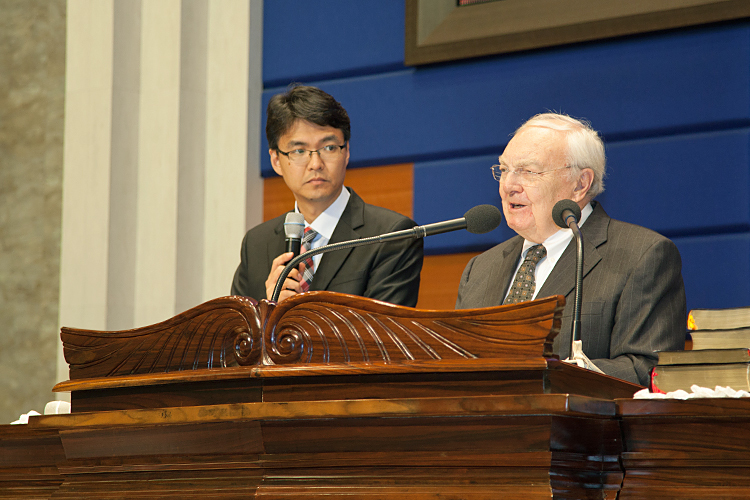 The members of Pyungkang Cheil Church were very grateful for the precious gathering and for the opportunity to learn the living word of God through Dr. Waltke, and prayed that his devoted life and ministry could further advance the work of God's salvation.